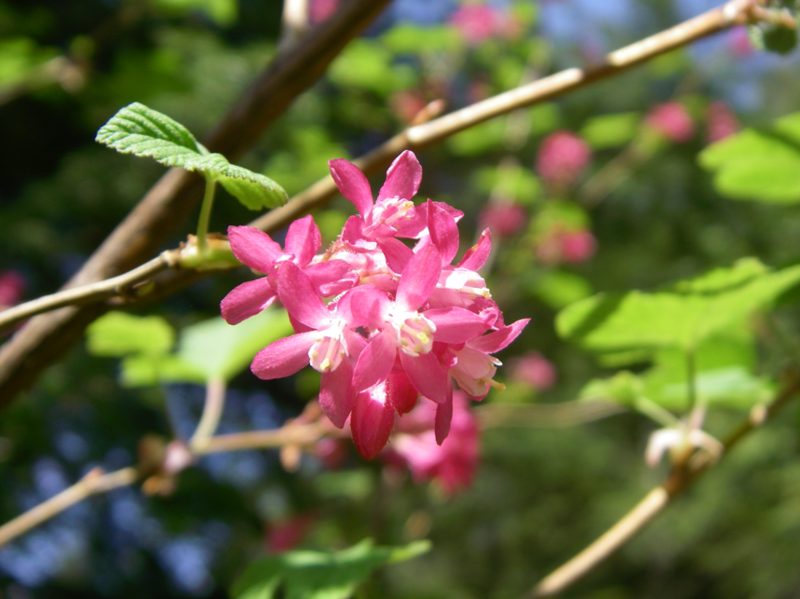 Names: Other common names include Pink Winter Currant and Blood Currant. Sanguineum means “blood-red;” referring to the color of the flowers; although the flowers are usually a rosy or pale pink. You may find plants with flowers ranging from white to a deep red. There are several named cultivated varieties with red, pink, two-tone or white flowers. Var. glutinosum, found along the coast of California and Oregon, has less hairy leaves. 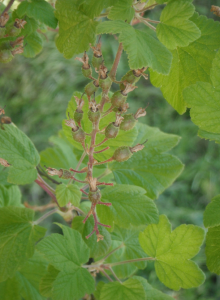 Currants and gooseberries belong to the genus Ribes (from the Arabic or Persian word ribas meaning acid-tasting). 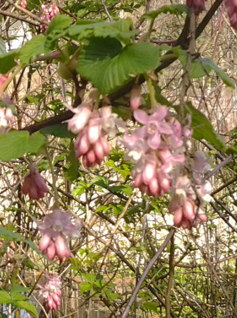 Relationships: There are about 150 species of Ribes in the temperate regions of the northern hemisphere, northwest Africa, Central America and in the Andes of South America; with about 50 native to North America. 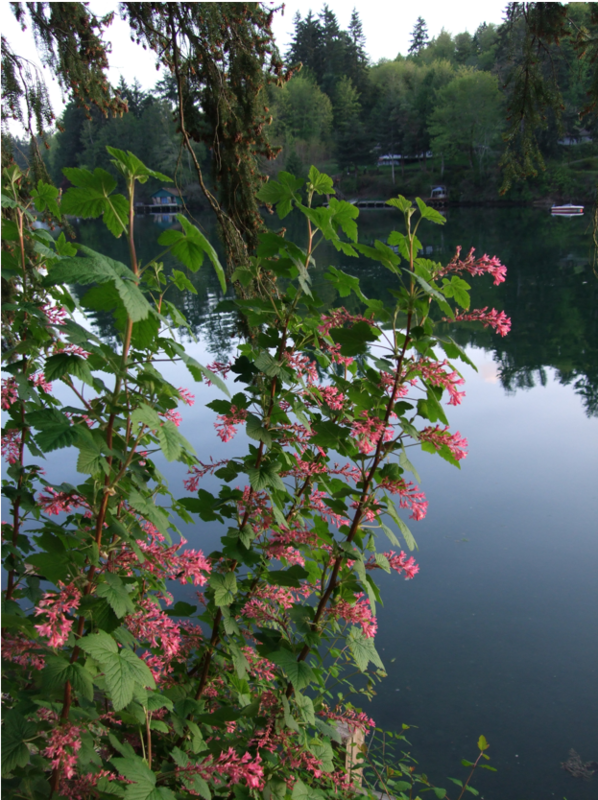 30 are listed in the Vascular Plants of the Pacific Northwest. About 7-8 are native to the west side of the Cascades with about a dozen more found chiefly on the east side of the Cascades and ~17 limited to California or Oregon. None of our westside currants are very tasty; Kruckeberg recommends the eastside natives Golden Currant, Ribes aureum or Wax (or the not so politically correct Squaw) Currant, R. cereum for edible natives. Some taxonomists separate gooseberries into the genus or subgenus, grossularia. In general, gooseberry plants have prickles; currants do not. 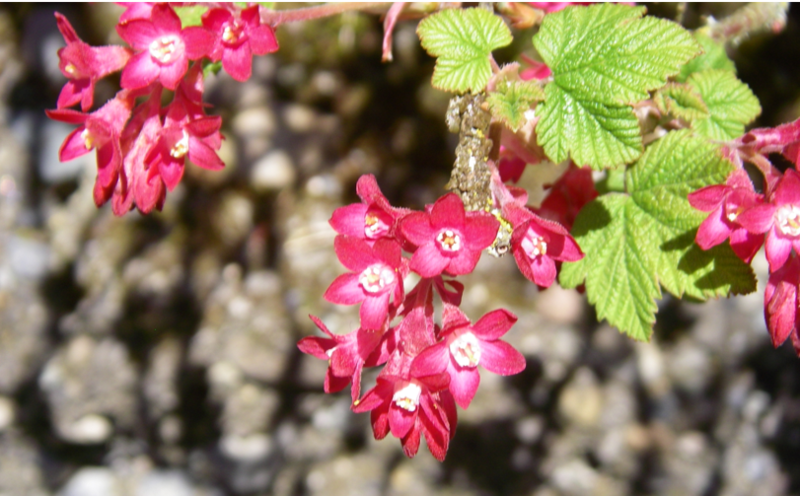 Ribes is the only genus in grossulariaceae; which is closely allied with escalloniaceae, and iteaceae; all formerly included in saxifragaceae. 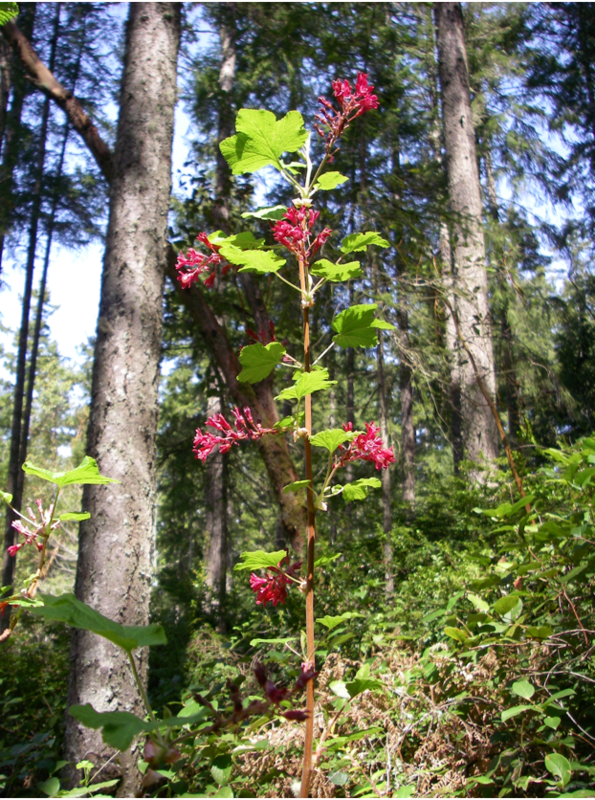 Distribution: Red Flowering Currant is found, mostly on the west side of the Cascades, from southern British Columbia to the coast ranges of central California; it can also be found in northern Idaho. Growth: This species grows 3-9 feet (1-3m) tall. Habitat: It is mostly found in dry, open woods. Blue-black berries with a waxy bloom. Diagnostic Characters: Leaves are 5-lobed similar to a maple leaf, crinkly, and finely hairy on the undersides. The foliage emits a pungent sage-like fragrance during hot summer days. 10-20 flowers are borne on drooping flower clusters. Flower color varies from white or pale pink to rose pink or deep red. Fruits are blue-black with glandular hairs and a waxy bloom. Stems are reddish-brown, erect and unarmed; the young growth finely hairy. 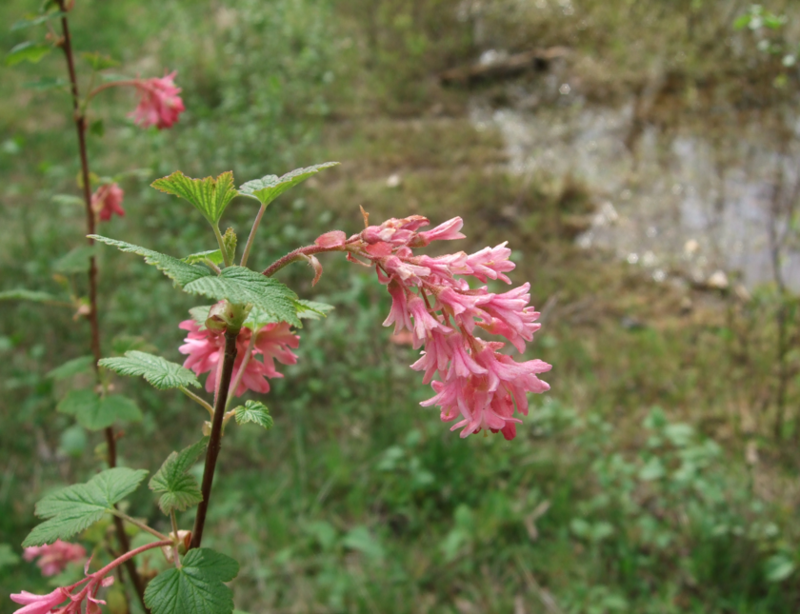 In the Landscape: Red Flowering Currant has been a favorite landscape plant since it was introduced to English horticulture by David Douglas. Many horticultural varieties were developed in England and subsequently reintroduced to their native land. Popular cultivars include: ‘King Edward VII’ and ‘Pulborough Scarlet’ with red flowers; and ‘White Icicle’, with white flowers. 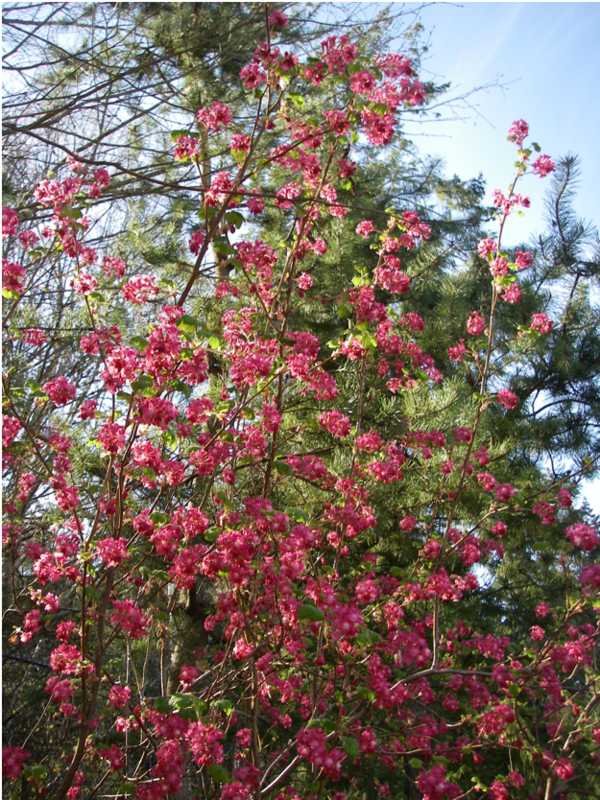 Cheery blossoms welcome spring and entice migrating hummingbirds into your garden. 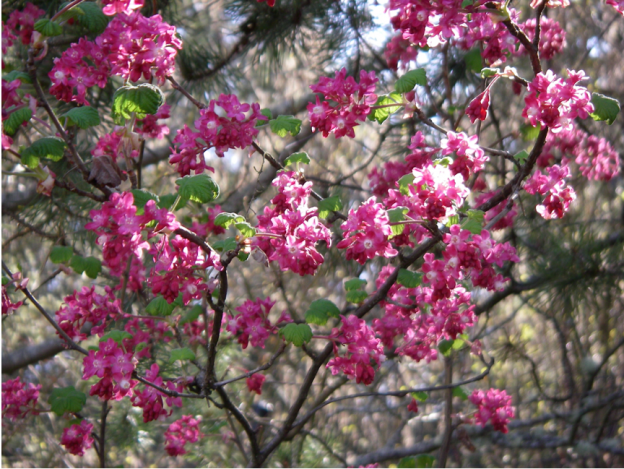 It is most spectacular in open areas, on slopes, or on the forest edge. It is drought tolerant and easily lives through dry summers with little irrigation. Phenology: Bloom time: February-April. Fruit ripens: August-September. Propagation: Stratify seeds at 35º F (2º C) for 120 days or sow them outside or in a cold frame in fall. 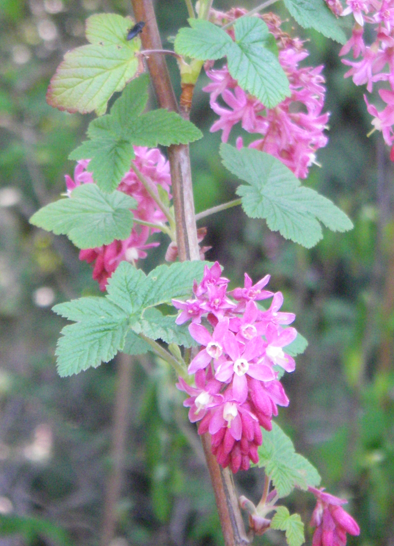 Red Flowering Currant is also easily propagated with hardwood cuttings taken in fall or semi-hardwood, earlier in summer. Use by People: The berries were eaten fresh by some natives but are not considered very tasty. 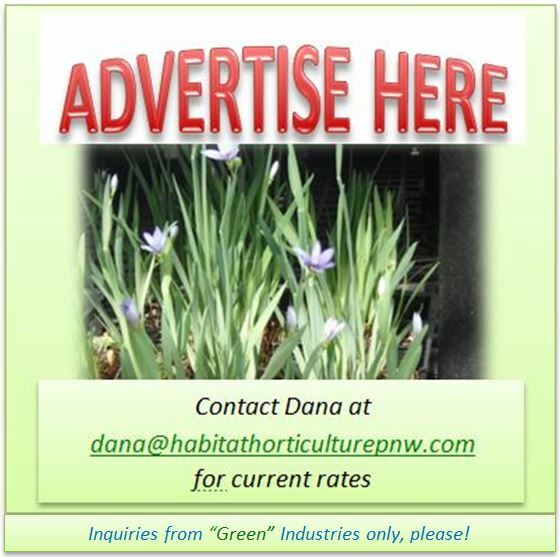 Use by Wildlife: Flowers are pollinated by insects and hummingbirds. The pink and red flowers are like beacons to migrating Rufous Hummingbirds. 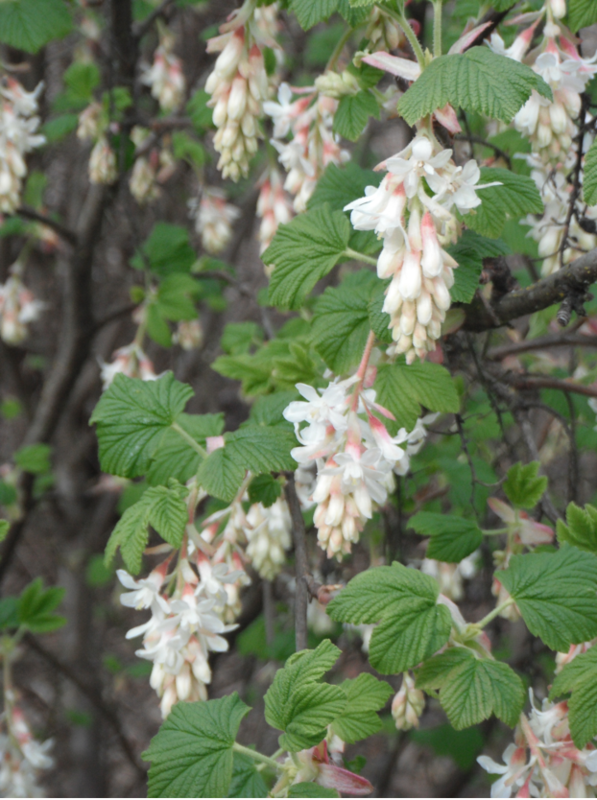 Make sure to put out your hummingbird feeders when you first begin to see Red Flowering Currant bloom in early spring! The foliage is eaten by Zephyr and other butterfly larvae. 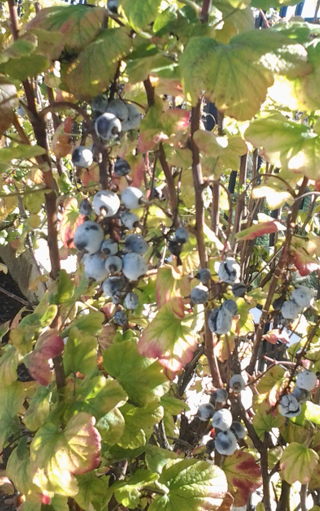 The berries are eaten by various songbirds and small mammals. *Because currants and gooseberries are alternate hosts of White Pine Blister Rust, they are often controlled, or eradicated in White Pine timberlands. This entry was posted in Deciduous Shrubs & Vines on August 10, 2016 by habitatdana.